Do you want a Father's Day to remember forever? There are 2 things a real man likes! Baseball and Wrestling, all in one place! June 16, take me out to the ball game! And before the game Ring Wars Carolina Pro-Wrestling is going to get you hyped up on MOUNTAIN DEW! Not really, but we will get you ready for the game! 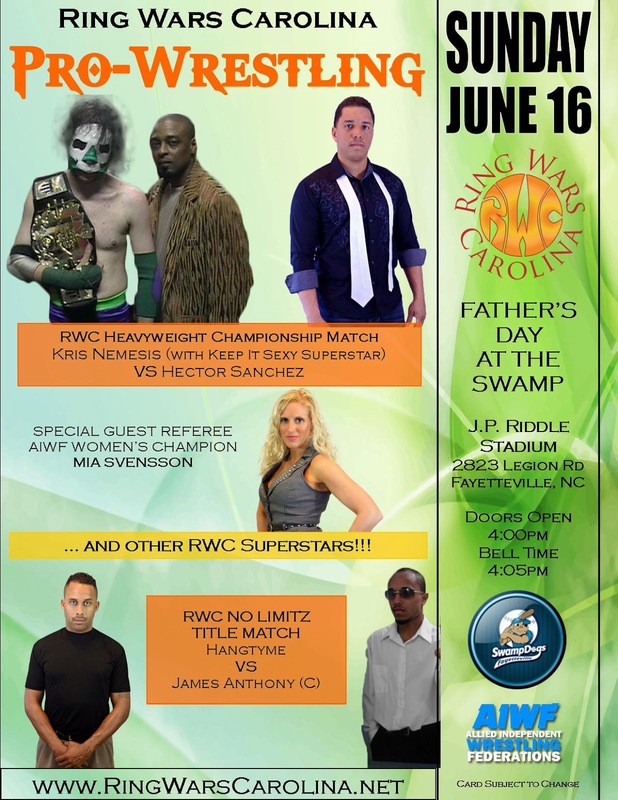 For the 1st time ever at "the Swamp" the RWC Heavyweight Title is on the line! The Champion, Kris Nemesis, grants the former champ one last rematch! Can Hector Sanchez regain The RWC Championship? The 1st RWC No Limitz Title defense for the new Champion, "The Caramel Candy" James Anthony. He will be taking on the man he beat for the title in the tournament, Hangtyme. These 2 matches alone are worth the time and effort to get here early! Now for the Guys, all the matches will be officiated by the AIWF Women's Champion, Mia Svensson! That is correct fellas. The Blonde Bombshell will be in charge all day long! See you guys on June 16, @ The Swamp on Legion Road home of the champion Fayetteville Swampdogs where Baseball is FUN!!! NEWS | RWC star behind bars!